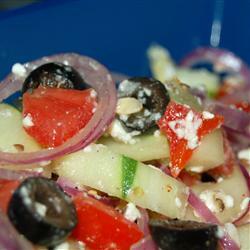 There is nothing better than a good crisp salad flavored with feta cheese and healthy Mediterranean oils. Fresh flavorful tomatoes and sweet red onions add to the goodness of this healthy salad. Did you know that the right amount of healthy fat is necessary in order to absorb all the vitamins in the vegetables? One of my favorite people in Louisville serves up this salad every day in her Deli off of Shelbyville Road in St. Matthews. If you don’t feel like making it yourself, I highly recommend that you visit Maria Bell and take some of her’s home with you (although I’m certain she uses other secret ingredients.) Enjoy… or OPA!!! I have a friend who I think is awesome, Maria Bell... Louisville's Greek Celebrity Chef inspired this. I once took a cooking class from her and this is my version of the Greek salad. She stressed that real oregano has a very nice fragrant smell. If you can't smell the oregano it's old or bad quality don't use it. As Maria would say ... SO GOOD FOR YOU!!! In a large Tupperware type bowl with lid combine all ingredients except for the tomatoes, feta cheese, croutons, salt and pepper. Seal with lid and shake well to coat with the dressing mix. Arrange in salad bowls, spoon chopped tomatoes over the salad and crumble the feta cheese over... garnish with croutons and offer salt and pepper for each individual to add to taste. Where is this Greek Deli… do they make moussaka? It’s my favorite Greek dish. Not as good as Maria Bell’s Greek salad… not too bad in a pinch.